Spin-off series of the manga and anime series Gangsta.written by Kohske (Gangsta. author) assistant Kamo Syuhei. This series follows Marco Adriano, before he join the Christiano family, when he was part of the first Destroyer squad. When I see people talking about Gangsta., the one thing I always do it’s telling them that if they enjoyed that anime, they should read the manga. Not cause the manga if far more better, it’s hard to compare an unfinished product, an anime series that will never be complete (unless another studio decide to reboot it even if the series is still ongoing series, and it’s exactly why I tell people to read the manga instead of watching the anime, the series is still on-going… I for myself really enjoy the manga, really, so when I knew there was a spin-off series in the making, I was quite happy. I got even more excited when I knew it was about Marco Adriano, Loretta Cristiano right-hand. 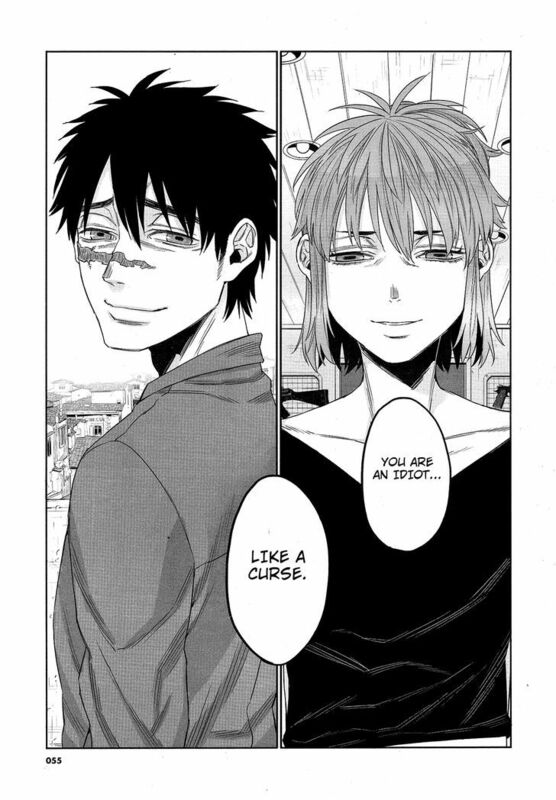 Reading Gangsta. made me curious about Marco since it is said in the series that Marco was once part of the Destroyer, the group who enjoyed killing the Twilight. I wanted to know how he was before and why did he switched group, passing from the bad guy to the “good” one and that is what Cursed was about to give me. Let’s start by the story, unlike the original series, Gangsta., Cursed is not as complicated, series is about the raid of the Destroyer, the raid that happened 15 years prior the main event of Gangsta. So the five volumes of cursed mostly cover the fight that happened with flashback here and there. The main point of the series is seeing Marco, knows as Spas realizing the Twilight are not the monster he thought they were, in fact they were human like him (if we can call both human of course). Spas/Marco realized the Destroyer were maybe the monster her since they were not only killing Twilight, but also normal human who were close to the Twilight. He began to doubt that what they were doing was the right thing, Gangsta. Cursed is not a series based on corruption like the original is, it’s about Marco wondering the legitimacy of his act. In the last volume, we see Spas/Marco adjusting to his new life, getting beat cause of this past action, to finally become accepted. We are also reminded a sword of Damocles is dangling over his head, if he lose the protection of the Cristiano, Gina will have his head. My favorite volume was the last one, it’s really wrap up everything nicely with Loretta’s birth and Luca giving the name of Marco to Spas to mark the beginning of his new life. The spin-off is written and draw by Kamo Syuhei, however we can clearly see Kohske drawing style here, I kept forgetting it wasn’t draw by her since both art style is very similar, I could almost say that they are identical, not a bad thing since it’s a spin-off, but if Kamo decide to make a new project, maybe he should find his own style. Did I enjoyed Gangsta. Cursed as much as I enjoy the original? I would say no since both story are really different, the impact are not the same, but I would still suggest to read it if you want to know more about Marco and where he is from. 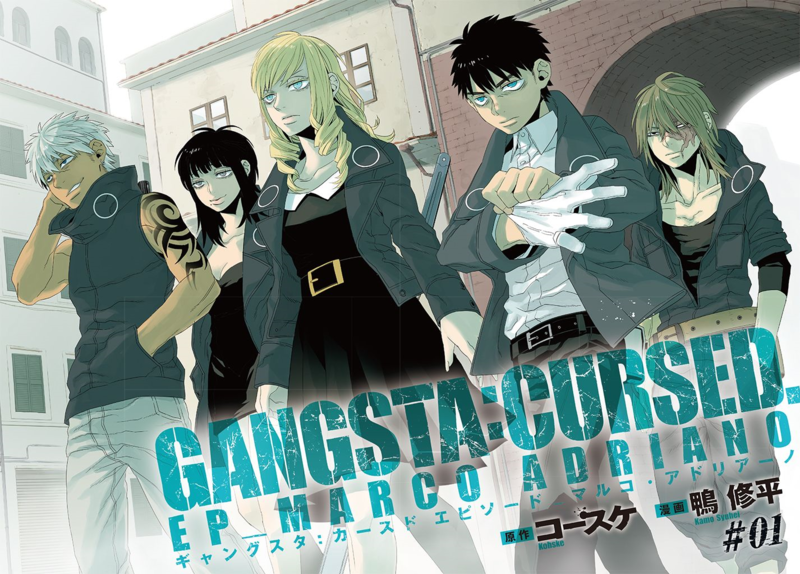 Did you read the series Gangsta: Cursed, EP_Marco Adriano? Are you planning to read it ?